Home › The Legacy of the Wild Mouse Lives On! The Legacy of the Wild Mouse Lives On! The Wild Mouse coaster was a singularly memorable Boardwalk ride experience from 1958 to 1975. "The Mouse" sat where the Logger’s Revenge station beckons visitors today. The Santa Cruz Seaside Company bought plans for the Wild Mouse from a German manufacturer, the cars were also German. The track was built in the USA, and the infrastructure and assembly of uprights and cross braces were acquired locally according to plan specifications. Everything was erected and assembled on site. Rides are not built from plans that way anymore. It tickles me that whenever we host groups for a Boardwalk tour, memories of this ride abound. People recall the emotional impact of the experience, usually after experiencing just one ride many decades ago. It always amazes me that folks still have such vivid memories of riding the Mouse when it has been gone for more than 40 years! For many guests, the ride was a memorable thrill and for a few others it was several minutes of terror! 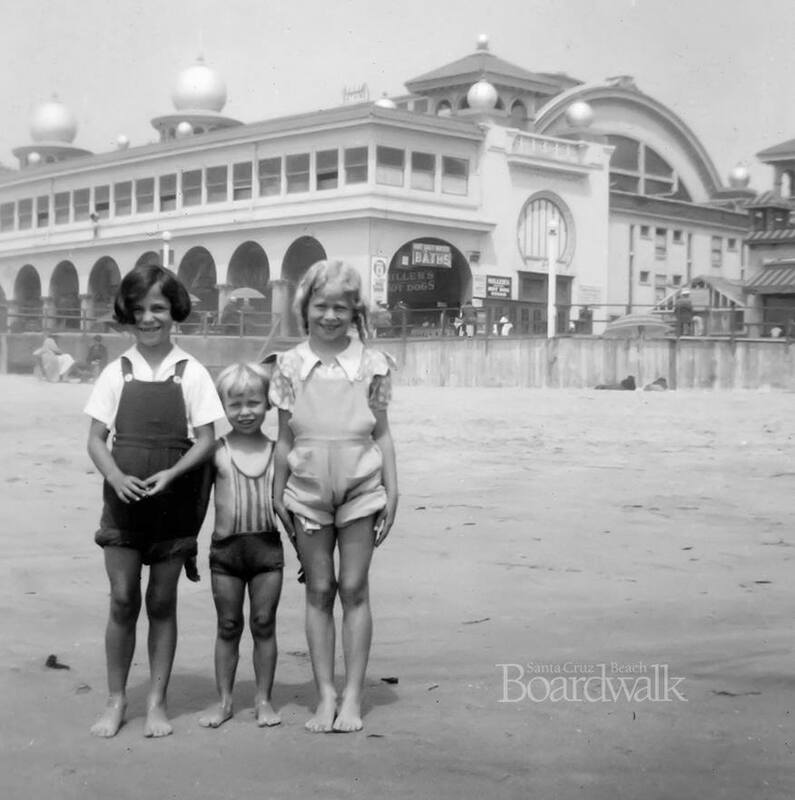 One lady describes being "caught in the wild mouse trap" in the Boardwalk’s centennial picture book A Century by the Sea. She naively supposed it was a children’s roller coaster nestled alongside its Giant Dipper big brother. She was so terrified during her experience she could not even scream! Afterwards, she commented that, had she known, "I would never have gotten on that thing!" I rode the Wild Mouse many times, how can the ride be described? My words won’t do it justice, but here goes! I remember the car might rattle some, but I later learned the noise came from the safety apparatus that secured the vehicle to the track. As the chain pulled the car up the initial hill, one got comfortable straddling the car’s center cushion. Coming off the lift, I recall how the car would begin to lift its wheels right and left as it negotiated the zig-zags that followed, going ever faster and faster. More weight in the car guaranteed a faster ride, too. Peering over the side, it was a long way down and a bit unnerving to first-time riders. Many thought the car might come off the track. (It couldn’t!) Then it accelerated along the first straightaway to a fast-approaching hairpin curve. Now you were really hanging on for dear life! I heard one former rider exclaim, "The car didn’t go ‘round that curve, it just changed direction!" It did it again right away, too. It was up and over a couple of humps, then speeding over a wide arc above the ride’s Boardwalk entrance to return on a straightaway with another couple of quick 90-degree turns that riders were better prepared for. Slowing to the jolt of hitting the station brake signaled the ride’s end. You either sighed with relief, never to go again, or your adrenaline was so pumped you were back in line for more thrills. I remember watching seasoned ride operators oiling the track in the morning ahead of an operating day. They would ride facing backwards in a car while holding an oil can near the metal track surface. That required great familiarity with the ride and was way out of my league! Several "behind the scenes" facts can be told about the ride. First, when it was originally installed it sat on sand – believe it or not. Then when the Boardwalk’s east end basement and deck were constructed in 1960, the ride was taken out of service and moved over on the sand so the basement and deck could be installed. Then it was moved back onto a cement surface where it remained until its retirement. Additionally, the ride was modified over the years to enhance its thrill effect. The long straightaway track the cars sped down after gaining speed on the upper zig zag’s was extended some. Then when the car came to the end of that section of track, the two hair-pin turns that followed were outside the ride’s support structure’s framework, adding a greater sense of precariousness. At the Boardwalk end of the ride, support for the wide-arch track the Mouse car traversed to swing around and head back to the rear of the ride was re-engineered to allow Boardwalk patrons to stand right under the track while cars careened overhead – greater excitement for riders and spectators alike! The Wild Mouse was removed in 1975 to make way for Logger's Revenge – a new ride with a much higher capacity and more family appeal. After it was dismantled, the cars, track and structural pieces were acquired by San Jose’s now-defunct Frontier Village Amusement Park. Sadly, the ride was never reassembled and its components were auctioned off when that park closed in 1980. If you want to relive the adventure of the Wild Mouse, you still can – virtually! There is a sister ride and one that is very similar to our Mouse at Luna Park in Sydney, Australia. Here's a YouTube link to a video a guest made of that ride. It will bring those faded memories in the recesses of your mind back to the front! Enjoy!